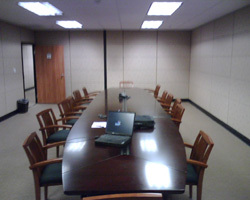 This deposition conference suite is in the heart of San Francisco. As an added bonus, the site is well landscaped in the plaza area and features sweeping views of the Bay Bridge and the San Francisco Bay. Our clients enjoy all these amenities plus a comfortable conference suite, videography services and a professional staff.